With chapter three complete, I’m going to take a short, two week hiatus to spend some time working on the script for the next chapter, preparing for SPX (which, by the way, I’ll be attending in September), and otherwise catching up on all my projects. I won’t be gone completely — expect a few sketches to show up over the interim — but chapter 4 will be starting on August 29th. 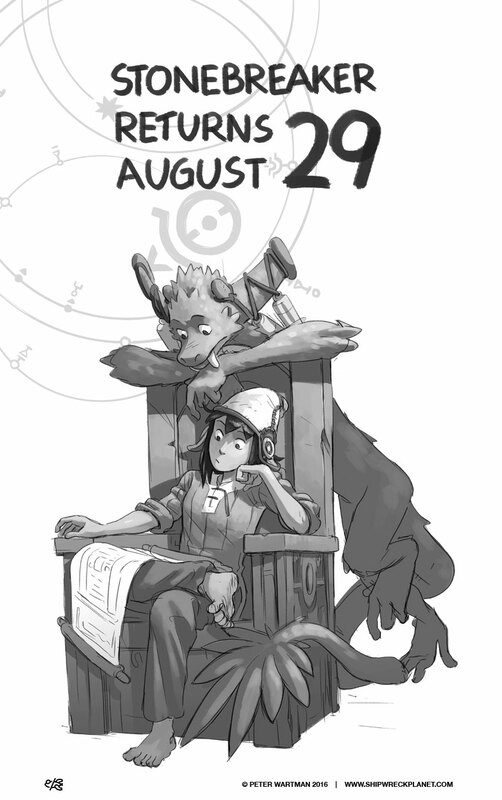 In the meantime, why not read Stonebreaker from the beginning, or go back all the way to Over the Wall? If you prefer your comics analog, the first two printed chapters of Stonebreaker are available in my store and the second edition of Over the Wall should be out soon. Thanks, as always, for reading! I’ll be back before long with more comics about giant monsters doing terrible things to architecture.